SUBHEAD: Advertising controlling the masses can be repurposed in order to liberate humanity. Really! 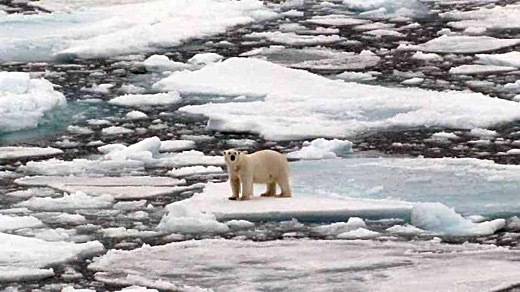 Image above: A polar bear amid melting ice with no place to go. From original article. A few weeks ago, New York Magazine published a devastatingly apocalyptic overview of climate predictions. We are on target for a 4 to 8 degrees Celsius warmer climate by 2100, at current rates of CO2 emissions. However, that doesn’t mean that nothing can be done to save our species - and the planet - from approaching cataclysm. In fact, if humanity was to awaken to our current plight and work together, we could transform the Earth in a positive direction that would allow us to thrive here for the long term. Unfortunately, at the moment most people’s innate response to the looming ecological mega-crisis is to suppress it, avoid it, or freeze like the fabled deer caught in the headlights. It seems too overwhelming to contemplate. Obviously, we need to find a different way to respond. The problem is that the effort to develop a systemic response and coherent strategy for making this change falls outside of existing categories - public or private sector, left or right, etc. First we have to understand what’s possible. I spent the last decade researching and considering what we must do to avert ecological collapse. The results are presented in my new book, How Soon Is Now? (published by Watkins, with introductions from Russell Brand - who calls it “a blueprint for the future” - and Sting). Let’s imagine ourselves - for a moment - as extraterrestrial observers watching humanity’s current gyrations from the surface of another world. We need to start from such a high level of abstraction before we drill down into the possible solutions in various areas. From such a distant vantage point, humanity would resemble one gigantic organism that is continuously transforming the surface of the Earth. From the alien perspective, we might seem to be something like rust, or a virus on the face of the Earth. However, the aliens would realize that this fast-developing species has the capacity for self-reflection and long-term thought. If or when we become aware of ourselves as a planetary entity - a super-organism in a continuous symbiotic relationship with the ecology of the Earth - we will rethink how we organize ourselves and how we apply our technologies. We will use our creative powers to replenish and restore the world’s ecosystems while we take care, responsibly, of our human family as one unified whole. Instead of a virus, we might intentionally mutate ourselves to become the Earth’s immune system. In my book, I defined the three main areas we need to address as our technical infrastructure (energy, agriculture, and industry); the social systems (government and economics); and consciousness (the set of beliefs, values, and ideologies which are imprinted by mass media and education). We can look at these three areas as gears that turn each other. For instance, when the technology of the Internet developed, it changed collective consciousness and had many influences on our political and economic systems. Together, the technical infrastructure, social system, and collective consciousness make up our current paradigm - the system we are in now, which is in the process, unfortunately, of annihilating the ecosystems we depend upon for life. In terms of the technical infrastructure, we know that we need to make a rapid transition to renewable energy - in a decade or two, rather than a half century or more. We also need to make a transition from industrial and monocultural agriculture back to regenerative farming practices that sequester CO2 in the soil. We need to transition from exploitative industrial processes to what the designer William McDonogue calls “cradle to cradle” manufacturing. In the short term, we also need to demand a sharp global reduction in CO2 emissions that will, indeed, impact the lifestyles of vast masses of people, above all the wealthy. The lifestyles of the wealthy are a much bigger problem than overpopulation. It is estimated that 50% of the world’s resources are consumed by the wealthiest 1% of the population. I know the idea of voluntarily reducing our excesses seems difficult to imagine from where we are now. But I will propose, later on, how this can be accomplished. Similar things have happened before. The gist of it is that we need to unleash a global marketing campaign that makes use of mass media, social media, and social networks and utilizes the levers of our individual and collective psychology, as effectively as advertising does. When we look at the technical challenges facing us, we can see they are difficult - but not impossible. Solar has already reached “grid parity” with fossil fuels. We have developed new methods for storing renewable energy sources (such as the Tesla Power Wall) as well as developing the “Internet of Energy” which will allow individuals and communities to feed energy back to the grid. One issue is the enormous “sunk costs” of the existing fossil fuel infrastructure - but forfeiting that is better than forfeiting a future for our species. Such a rapid energy transition is not something that can occur purely through market mechanisms. It would require a melding of public and private interest. Hard as this is to imagine, it has occurred in the past: After the 1941 Pearl Harbor attack, for example, the US shifted all factories to wartime production within a few months. Production of consumer goods like private cars were stopped. The wealthy were taxed at more than 90% and this capital was used for wartime goals. If this has happened before, such a concerted effort can happen again. People have to recognize the ecological crisis poses the same level of existential threat as the Nazis did in World War Two. It requires the same level of collective, committed response. Farming practices must change as drastically as energy production. According to the United Nations, we only have 60 years of harvests left with current industrial farming practices, in any case. This is because we are depleting the world’s topsoil. Luckily, there are other - in many cases older - forms of farming that replenish and restore topsoil. These include organic farming, no-till farming, and permaculture. These practices also sequester carbon back in the soil - potentially huge amounts of CO2. We also need a large-scale global reduction on meat eating, as animal agriculture is extremely destructive to the environment. 30% of the Earth’s surface is animal grazing land. With a reduction or moratorium on meat, we can reforest this surface area, creating carbon sinks. Reforestation can be accomplished quickly using the latest technologies such as drones to plant trees and Artificial Intelligence to help replicate diverse self-supportive ecosystems. While it is true that regenerative farming practices require more skilled labor, more people working on farms, as well as smaller farms, this is also not technically impossible or unfeasible. In fact, we are seeing increasing automation in many fields that will eliminate millions of industrial jobs over the next decades. An interesting question is - what are people supposed to do once all of the old industrial jobs have disappeared? Retraining people to be custodians and stewards of their local lands, teaching them to grow food, combining the best knowledge from the present and past, could be socially beneficial on many levels. To accomplish this will also require a shift in the third area I mentioned upfront - our consciousness and ideology, which is imprinted through the media. Essentially, over the last few hundred years, we developed an ideology of one-directional progress and modernization that benefitted corporations and large-scale commercial enterprises. According to this ideology, the rural areas were boring and stagnant. Mass populations would relocate to cities and people would find it more exciting to work in sweatshops or small factories, as Uber drivers or in marketing firms. In essence, to make the transition that is now necessary, we need to change our vision of progress once again. People living in healthy multi-generational communities out in nature, working less, growing food, taking care of their local ecosystems - combining the best of modern technology with some aspects of ancient and indigenous cultures - could become a new paradigm for a humane and resilient post post-modernity. We could actually resettle the rural areas as part of a movement toward decentralized and resilient communities. Resilience will be a necessary virtue in the near-future, as we confront intensifying battering from “super-storms” and other impacts of the ecological crisis. Decentralized communities that can grow their own food and make their own energy are maximally resilient. Our industrial paradigm must also change drastically from the models of “planned obsolescence” and “conspicuous consumption” that fueled the last centuries of industrialization. It is increasingly obvious that we are living on a planet of finite and limited resources, yet we have constructed a commercialized industrial system that requires constant over-production of disposable goods that poison the environment. Plastics, for instance, now infiltrate every ecosystem on the planet and concentrate in the fatty tissues of animals, causing hormonal disruptions and cancers. We have been hypnotized and entranced by our own technical powers yet unable to master them and use them wisely. This must now change. The alternative is that we redesign our systems of industrial manufacturing, over the next decades, so they are close to zero-waste, or even feed back benevolently into the Earth’s ecosystems. While this seems impossible from where we are now, we do have a great model for this - nature itself. Nature is ceaselessly productive and her productions do not harm the biosphere but only add to its fertility and abundance. In Cradle to Cradle, designer William McDonogue proposes that all of our packaging could be designed so it is compostable and contains seeds. When you eat an ice cream, you bury the wrapper and a little garden grows from it. McDonogue believes we can redesign all of our industrial systems along the same principles. While this seems difficult to imagine now, we must remember that many things which seemed impossible have, in fact, come to pass. Flying around the planet in a metal tube was impossible - until the Wright Brothers came along. Forms of plastic are already being developed out of biodegradable and nondestructive materials such as cassava and hemp. “Biomimicry” may also provide many answers. The point is that we need our academies and laboratories to innovate in this direction, and unleash our creative genius on this area, comprehensively. Tools and gadgets that require rare metals and other minerals - like laptops and Smart Phones - should be designed so that their components can be replaced and recycled. The bylaws of companies must change so they are responsible for their products over the entire course of their lifecycle. I know it seems difficult, if not impossible, to address these areas in the systemic way I have proposed here. This is because our social systems and ruling ideologies are organized against it. We live in an odd circumstance where we have been indoctrinated and programmed to believe that unreason - irrationality - must triumph. If we are going to make a rapid transition to renewable energy over the next decade or two, while we engineer a transition to regenerative agriculture and at the same time redesign our industrial manufacturing processes to minimize waste and mesh with the Earth’s ecology, this will require a deep transformation in our social systems as well as our ruling values and ideologies. It will, also - we must accept - profoundly impact our daily lives and habits. We will have to change our consumption patterns, reduce our excesses, as well as some of our short-term expectations for the future - both for ourselves and our children. However, when we fully realize the alternative is a universal collapse and apocalypse that will ruin our children’s future and leave the Earth close to uninhabitable, we can make this choice happily - choosing it as a mission and a destiny. When we start to respond as a society to the ecological crisis, we may find we enjoy life more. Building new community networks and moving toward resilience will increase our sense of personal satisfaction while ending our feeling of alienation from one another and the Earth as a whole. One main factor accelerating our rush toward global cataclysm is the underlying design of our economic system. We can look at corporations as artificial life forms that humans have designed to survive and compete in an artificial game that we also created which we call the stock market. We gave these artificial life-forms only one prime directive: In order to survive and “win the game,” they must maximize financial profit and shareholder value. This is, therefore, exactly what corporations do - like robots. If a corporation can only survive and win its game by maximizing financial value, then it naturally must work to overcome anything that stands in the way of that goal. For instance, a corporation must seek to evade environmental restrictions that reduce its profit margins. If the health and diversity of local ecosystems or communities stand in its way, it must break them. Such an artificial life-form - designed with one purpose only - must also naturally self-select for the most sociopathic character types as it needs CEOs and leaders who have no ethical compunction or concern for externalities. In this sense, we can’t even blame a company like British Petroleum for despoiling the Gulf of Mexico, to take just one example. Evading restrictions, corrupting governments - that is what corporations have been designed to do. Similarly, our money system is a design artifact that enforces certain kinds of behavior patterns. A debt-based currency issued by private banks and backed by government loans, money is designed to maximize competition and create artificial scarcity, as well as winners and losers. In his book The Future of Money, Lietaer looks at the history of monetary systems and finds examples of more balanced societies that also used “Yin” currencies which foster collaboration, community, connection, and sharing. Lietaer proposes that we could create a global trading currency he names the Terra that would have a “demarrage” charge or negative interest rate. In other words, when you receive a Terra, it has a time stamp on it. It quickly goes down in value as you hold onto it. Your best option is, thus, to get the currency back into circulation rather than hoarding it. This is one innovative idea that could lead to a less destructive money system. There are many others. The blockchain - the underlying technology upon which crypto-currencies like Bitcoin, Ether, and Tezos have been built - could provide the new infrastructure for a rapid redesign and reinvention of our financial system. However, a new financial system can’t simply imitate the same destructive processes and hierarchies of our present system, if we want to interrupt our march toward ecological suicide. If we want an ecologically sane society, we will need to radically reduce the current extremes of wealth inequality, which create irresponsible attitudes and practices for rich and poor alike. Blockchain - a transparent accounting ledger that is distributed and decentralized - could also provide the basis for a global direct democracy that scales from the local to the bioregional to the global level. We could potentially create a truly democratic system where everybody, ultimately, has the equal right to contribute - to debate and decide on our collective future. This may seem scary at first, but alternatives may be even less feasible. We are seeing new prototypes for collaborative governance developing online in platforms like DemocracyOS and Loomio. Just as our economic system is a design template from over a century ago, our current political system was largely constructed in the late 18th and early 19th Centuries, when information only moved as fast as horse-and-buggies or schooner ships. The rate of change was much slower than it is today. In fact, when we look back through history we discover there is an intrinsic relationship between the predominant form of media and the ruling political-economic system. For instance, we could never have had empires like Rome or Babylon without a written code of laws - without the media technology of writing. We could never have had the modern nation-state with its liberal democracies and parliaments without the printing press, which made it possible for many people to follow the news of the day and have enough knowledge to vote in elections. With the Internet, we have a new, profound system of globally interactive communication and it points toward a profound transition in our social, political, and economic infrastructure. The regressive movements happening now express a tension between the older modes of authoritarian control and the new possibilities and potentials inherent in our new media and communications infrastructure, which points toward the potential for a much deeper level of democratic decision-making, as well as a sharing of wealth and power. I realize these considerations may seem very abstract to some readers - it may seem a stretch to connect them with our urgent and immediate need to deal with an ecological emergency that threatens our tenure on this planet in the near-term. However, I believe that all aspects of this crisis are linked together and it is crucial to understand it, as a system. Without the right viewpoint on it, we can’t make the right moves, whether in the short or long term. All of this is explored in my book in greater detail. So then - let’s return to the somewhat mind-boggling question of how we can approach the multi-dimensional ecological crisis we have brought upon ourselves in the short term and avert what seems to be probable if not inevitable catastrophe? I propose the following as methodology and next steps. In the next years, we must create a broad-based movement of civil society, globally, that is solution-focused and positive - that recognizes not only the threat of climate change and environmental crisis but also the opportunity this crisis provides us to reinvent our society so it is truly equitable, empathic, and corresponds to our deepest and best impulses individually and collectively. The problem with organizations like Greenpeace or Bill McKibben’s 350.org, I believe, is the lack of a brilliantly inspiring and redemptive vision for the future. We need a movement that offers a thrilling vision of our future together, particularly for Millennials and even younger people. In some ways, in fact, our future looks very bright. If we can handle the ecological threat — a big “if” — the prospect of automation combined with a Universal Basic Income could alleviate humanity, as a whole, from degrading work and senseless drudgery. We could liberate the knowledge commons so that people everywhere have unlimited opportunity to learn new skills. The prospect of settling other planets is, also, an exciting one. I also believe the new paradigm may include an intentionally guided evolution of consciousness as well as an exploration of altered or non-ordinary states of consciousness. While this seems marginal now, it may be important or even crucial for our future. This is something I have explored in depth in past works - it is too much to unpack here. Personally I am persuaded by the overlay of quantum physics, the Holographic Universe theory of David Bohm, and the mystical traditions of Eastern cultures like Tibet and India. The melding of ancient mysticism and modern techno-science may turn out to be an extremely important aspect of the transformation taking place. As science and mysticism converge (even Elon Musk now believes we are living in a kind of simulation similar to what Gnostics spoke about a few thousand years ago), we find that our self-identity, our sense of purpose or meaning, and the way we envision humanity’s place in the universe are all changing. In any case, the idea that we could orient ourselves positively toward a creative and participatory future could be deeply inspiring - and profoundly different from the ideology of corporate globalization culminating in a technological Singularity where silicon fuses with flesh. There may be many potential future orientations that are valid and valuable. Some people may fuse with machines while others choose to return to a more agrarian way of life. I know these ideas seem abstract - but we need new, powerful, abstract goals to orient us and provide ideals for people to rally around. Patriotism, satyagraha, the ideal of a “Master Race” provided such goals for mass movements in the past. We need new collective myths to support our transition to an emancipated, ecologically regenerative society. We have reached an amazing and critical juncture. On the one hand, we see extraordinary progress happening in many areas. On the other, our rapid evolution over the last centuries has unleashed an ecological crisis that could bring our species to an end or lead to a crash back to a much smaller population. This time happens to be critical. A beautiful outcome is possible, still, but to get there, we will have to cooperate as never before. We will, also, have to commit to building a future that elevates and enhances our human community as a whole as we care for our threatened ecosystems and seek to repair and reverse the damage we have done. We can co-create a global society defined by universal abundance within the next 20 to 50 years - probably closer to 20. This would be a world where nobody went hungry and everybody had access to knowledge and ongoing education and job retraining via the Internet, supported by a basic income. But to get to that place we must first undergo a period of transition that will be difficult and challenging - but also, potentially beautiful, if we rise to this occasion. We must understand that individually and collectively, we are on a hero’s journey, a trial by fire. The fact that we are more connected than ever before - almost as if the global brain has spontaneously emerged just when we need it most - might mean that new ideas and a new awareness could spread rapidly at the propitious moment. Imagine, for instance, if Google and Facebook were to put what I just wrote above on their home page. 2 billion people now use Facebook every day. Zuckerberg has recently announced his interest in Universal Basic Income, and proposes that fighting global warming could be a rallying cry for the Millennials. Google and Facebook - or other social networks that develop through peer-to-peer computing or the blockchain - could be used to warn everybody on Earth that we are confronting the immediate prospect of ecological decimation. These platforms could be used to give people the necessary information they need to make many changes in their daily lives. Through social tools, groups could be formed that would support millions of people in shifting to vegetarianism, sharing cars and tools and other resources, engaging in voluntary campaigns of bioremediation, ending the unnecessary use of plastics, and so on. We now have the mapping and geolocating capacities to enhance our efficiencies and support conservation in many areas. A massive short-term jobs program - something like the WPA in the 1930s - could be unleashed to transition our energy infrastructure to renewables and shift our farming practices to regenerative ones. Many forms of tech innovation are developing rapidly that could be implemented universally. For instance, vertical farms and massive solar collectors can be built. Urban rooftops can be painted white or gardens put on them to reduce the albedo effect. Biochar is an industrial process that creates energy from biomass while sequestering CO2, ending with a carbon-rich tilth that can enhance topsoil. Industrial Biochar could be scaled up globally. I tend to believe that to make this deadline, we need a new media network that is global and funded to the same level as FOX or CNN. This network would be laser focused on ecological solutions and pragmatic alternatives. No problem would be presented just to create fear and anxiety in the viewer’s mind. Every program that presented a problem in the world would also propose actionable steps to solve it. The content would be linked to participatory networks where people could engage immediately in bringing about solutions. One simple way for a network such as this one to be launched would be for a group of progressive billionaires, realizing the necessity, to come together to contribute the seed capital. Because many people are currently hypnotized or brainwashed by FOX in particular, this new network would have to make use of similar tropes, repetitive memes, and production values. It could also integrate user-generated content, engaging its audience in a new way. What I have offered here is a brief overview, indicating both the direction of the change we need to make, and the actionable steps that are required in many areas. I know that most people in the mainstream will immediately reject this plan as impossible. The fact is that nothing is impossible for us, once we set our minds to it. We certainly don’t know the limits of what we can do - at least until we try with all of our will and courage, and we haven’t done that yet. I also think, considering the scale of the problems, the solutions are likely to be rapidly scalable, growing exponentially once we have found the answers. For instance, when a community develops that is largely self-sufficient and makes a positive local impact, the templates for how that community governs itself, as well as its daily practices, can be shared and copied widely. The techniques of television, advertising, and branding that have been used so successfully to dominate and control the mass mind can be repurposed in order to liberate humanity from its delusions. The most important thing to realize is that, despite what doomsayers tell us, our fate still rests in our hands.